For Western Digital hard drives, it often appears the situation that disk can not be ready due to long time busy status, or the disk can be ready, but when there is a data interaction, the disk turns into busy status and can not be ready again. In such a case, what we need most is the ability to read and write hard disk’s system area, only then can we modify firmwares of system area and solve the problem of long time busy status or slow responding. 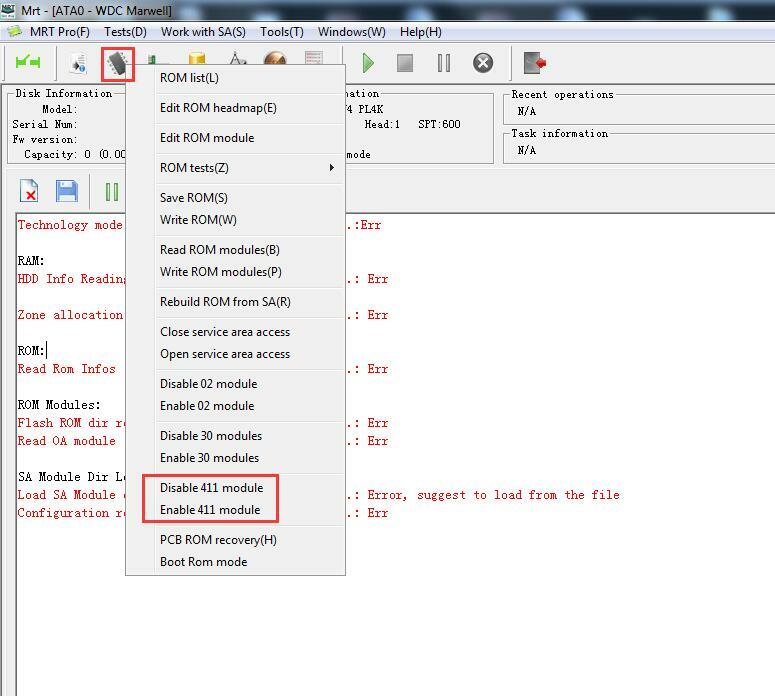 The conventional method is to close the entry of system area or add defects to system area, and then load LDR to obtain the normal reading and writing access; What’s more, we can also use “Disable 02 module” function to obtain the reading and writing access of system area. However, these methods have their own limitations. For example, sometimes it is difficult to find needed LDR; On many new models, “Disable 02 module” function can not effectively obtain the reading and writing access of system area. And this is the time we need to use our new function of “Disable 411 module”, using this method to repair new Western Digital hard drives’ firmware problems can be much more effective. 1. If hard drive keeps busy status, we need to short circuit it or use jumpers, then power on the hard drive. 2. When the disk is ready, enter into MRT WD utility and click “Disable 411 module”, there will be log in log interface. 3. After that, we power off and on; if jumpers were previously attached, please remove them before powering on. 4. Please wait for the disk to be ready again, then re-enter into MRT WD utility. ©2003-2018 Wuhan SiTuoFu Technology Co., Ltd All rights reserved.